D0+CDF result confirms that such analysis depends on the model too much to be believable (probably even with much higher statistics!). It just shows how hard it is to do measurements when background is dominating (and isn't flat). If CMS and ATLAS can provide better jet kinematical resolution, we will probably get a definite answer from them (and that by the end of summer). I guess CDF guys should first agree on jet spectrum with D0 before making bold claims about new resonances (such are only a gamble for gaining reputation if by any chance they are right). Dear Jester, it's misleading to say that only CDF says that it has 4 aces in their hand while D0 only screams that it's a cheat. CDF holds 4.2 aces or so - as you mentioned some time ago - while D0 holds 4.3 aces in claiming that the picture on the CDF card (150 GeV resonance with 4 pb cross section) is bogus. The probability that such a bump is consistent with the D0 data is 8 parts per million. Given that the data are the same, the only thing this comparison tells us is that there appears to be a large, uncontrolled (and usually unreported) systematic uncertainty in these experimental results. Why is there a deficit at 255 GeV? 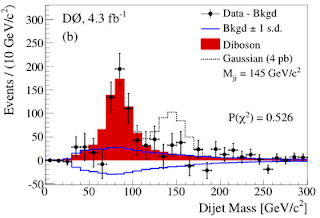 It seems the D0 simulation describes the background better than CDF, especially at lower dijet mass. Their data points are consistent with the simulation everywhere. I choose to trust D0 on this. So what is left as an explanation? That CDF has some sort of very subtle detector flaw that has managed to evade 20 years of scrutiny? Human error that has confounded 2 different but large (and well trained) groups of CDF analysts. Or one of the weirdest statistical flukes in particle physics history. None of the above sounds likely, but then it more or less has to be one of the above, assuming D0 really did use the identical Monte Carlo algorithms, and took close to the same cuts. "So what is left as an explanation? That CDF has some sort of very subtle detector flaw that has managed to evade 20 years of scrutiny? Human error that has confounded 2 different but large (and well trained) groups of CDF analysts." Error is probably too mechanical a word for what is going here, which apparently involves the baseline background calculations. Nobody suggests that the difference is due to a simple calculation error, and neither group calculating a background is claiming that their estimation of the background is exact either. Both quantitatively approximating the background by making assumptions about what approximating shortcuts are material and what are not without knowing precisely how much those approximations really differ from an exact mathematical calculation that is beyond our capacity to carry out even though the Standard Model supplies an equation for that calculation that we are simply unable to solve exactly analytically as opposed to by numerical approximation. It sounds like the issues are with the strategic decisions that the two groups took to develop a method to approximate a background from the same Standard Model QCD equation, rather than anything about the physical experiment or data screens used. And, the fact that one or the other is closer to the truth here doesn't necessarily mean that one approximation or the other is more accurate in all circumstances. An approximation that may be important in the background in lots of experiments may be unimportant in this one, or visa versa. Approximating backgrounds is an art as much as it is a cut and dried procedure. Something as simple as a well chosen decision to use polar rather than x and y coordinates in a given equation, or visa versa, based on the nature of the data inputs, could materially affect the accuracy of the background estimation in some little part of an overall plot that is much larger than the one focused on and reproduced in articles and blogs. In this case, I think that there is a good chance that the two background calculation groups may manage to reconcile their efforts and reach a mutual consensus on which is best (possibly a mix of the two methods), in part, because from a sociological perspective, there is less of a psychological need to defend an outlier result when there is no single theoretical explanation of it that is really compelling even though there are multiple possible theories that could explain it. It is easier to back off of a result that could be any of a half dozen things that there was no consensus predicting before the experiment was done, than it is to back off, for example, data that would convincingly and unequivocally show a 4th generation top quark, and couldn't be anything else, if true. If this is an oscillation? Sure, it is an oscillation between ignorance and rush to judgment. Neither CDF nor D0 is cheating and the only rational approach is to ask whether there is a new physics based explanation not only for CDF bump but also for the CDF-D0 discrepancy. For an approach along these lines see this. there's no one here from Cern? Hang on. What is the significance of D0's observed yellow Gaussian? Is that in the paper? Their conclusion is interesting : "These limits disfavour the FCNC interpretation of the Tevatron results." About the no same sign tops, I agree this is very interesting, but it's not exactly a surprise. You can see from the plots in 1101.5625 that for the AFB models which yield this final state, the signal is so immense that discovery would have been possible months ago, if this were the mechanism behind the Tevatron anomaly. The lack of five sigma papers leads one to draw the obvious conclusion... Of course, it's really great to see the explicit limits! It might also be worth pointing out that this result by no means excludes all of the t-channel models for the top AFB, just the simplest ones where the mediator carries no charge. There are plenty of nice t-channel models left to be ruled out using other signals. Welcome. Hope you have fun! When are you gonna tell us everything about Z' at CMS? On page 4 of their preprint D0 say that the diboson background monte carlo is generated with PYTHIA and then normalized to the NLO cross section from MCFM. But then on page 5 they state that they do a fit of the backgrounds to data, in which "the cross sections for diboson and W+jets production in the MC are floated with no constraint". Does the fitted diboson cross section agree with the MCFM NLO prediction? This question is not answered anywhere in the preprint. Hi Heather, just counting the events in the Dzero di-boson peak it gives around twice the number of events compared to the CDF peak. The CDF di-boson cross section is fixed to NLO.